Victoria Bowling Club » Well done Ray, Brad & Steve! Well done Ray, Brad & Steve! You are here: Home » Blog » Competitions » Well done Ray, Brad & Steve! 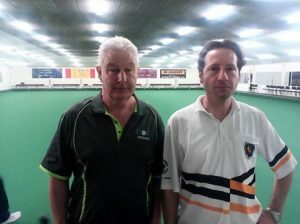 Well done to Ray Martin and Bradley Down coming runner-up in the Professional Bowls Association World Indoor Pairs qualifier in Hastings this month. Ray and Brad were unlucky to lose against locals Murray Glassey and Paul ‘Bart’ Sorensen 4-5, 11-4, 0-2. The jack spun and bounced around after a Sorensen drive ending up on a Hawkes Bay bowl in the last end of the first set. The Victoria pair were in full control in the second set forcing a tie-break but were unable to tip up Glassey and Sorensen in either tiebreaker end. Lou Newman paired with Johnsonville’s Dale Rayner, also pushed Glassey and Sorensen to a tiebreaker in the semifinal before going down 0-11, 8-5, 0-2. Brad picked up a bundle of ranking points over the weekend also reaching the semifinal of the Scottish Singles qualifier a day earlier going down to Manawatu’s Darryl Johnson, while Ray Marti n signalled his arrival on the PBA scene pushing New Zealand number one Glassey all the way earlier in the day. Stephen Zino was emphatic in retaining the Scottish Singles qualifying spot in New Plymouth that he won last year dropping only one set against touch opposition including Ian Monaghan (Wairarapa) 12-5, 11-2 in the final with a fine display of draw bowls. Although unaffiliated to an outdoor club, Stephen always turns up in New Plymouth proudly wearing his Victoria shirt. Stephen will play in the NZ PBA Finals Weekend scheduled for September 8th-10th in the new Naenae indoor complex.